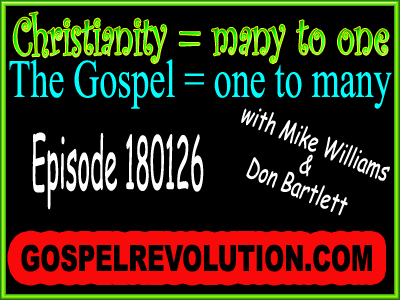 Christianity is many to one, but the gospel is one to many! Wow! What a powercast this week we had. We opened the mailbag to Doug Salonen and Dan Randolph. The star of the show however, was Michael Lilborn Williams, as we reverse engineered 2 Timothy 1:12 and he unpacked the context paragraph by paragraph. This was indeed one NOT to miss, ad to tuck away amongst your specials. It will make a great outreach tool and we are going to showcase the main message on the front page at www.gospelrevolution.com for quite some time. I just love it when you guys expose the word of filth ministry, their haughty preaching salesmen and sales women. These liars NEVER grow a limb out but they have a book and CD to buy telling you how. Love the in context reading of Romans 3 and the ” before the world began Gospel”. Easy to understand.